AxonTracker 3D software tool was developed by the Center for Bioengineering and Informatics(CBI) at the Methodist Hospital Research Institute in collaboration with Lichtman Group at Department of Molecular and Cellular Biology, Harvard University. 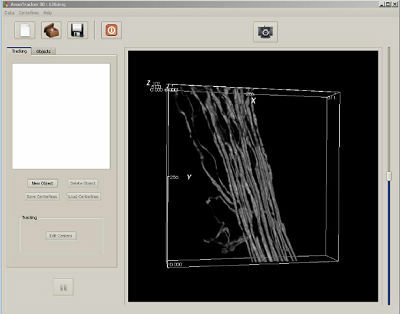 The software is useful to semi-automatically track and label axon structures from the motor axon connectome datasets. It is a parameter-free software, and hence can be used over a broad range of datasets. The software is designed with ease of use in mind. The interface is simple and includes a 3D visualization of the dataset along with a real-time overlay of the tracking results. A 2D view of the dataset is also provided in order to interact with the software. Three orthogonal views are provided with a provision for back-tracking the results. Points can be added/deleted from the tracking results to provide guidance in case of an error.